The Cazador (#4) gets up over Jrs Taylors Runnaway(#2) and Jet Black Secret (#5) as the trio set the top three fastest times in Sunday's Mardi Gars Derby trials at Louisiana Downs. BOSSIER CITY, LA--FEBRUARY 25, 2018--Leading Louisiana sire Sir Runaway Dash sired three of 10 qualifiers, including the two fastest, to the $87,506 Mardi Gras Derby during four trials contested Sunday afternoon at Louisiana Downs. 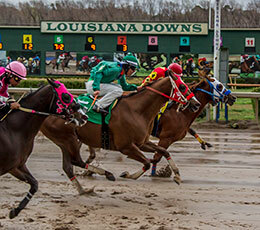 The 10 fastest state-bred qualifiers will return to Louisiana Downs on Saturday, March 17 to vie for a winner's purse worth $39,377. The Cazador got up in a blanket finish in the second trial to defeat Jrs Taylors Runnaway and Jet Black Secret. Ridden by jockey John Hamilton, the son of Sir Runaway Dash clocked the fastest time of :19.922 seconds. Jrs Taylors Runway and Jet Black Secret followed with the second and third fastest times of :19.941 and :19.950 seconds. All three were awarded a 94 speed index over the sloppy "sealed" racetrack into a 10 mph crosswind. Lightly raced, The Cazador picked up his second career win in five starts for owner Rayne Knight and trainer Michael Zingelmann. Hamilton was back in the saddle after surgery on a broken leg two months ago. Zinglemann and Curtis Crewnwelge bred The Cazador from the Toast To Dash mare Told Ya. Runner-up, graded winner Jrs Taylors Runnaway, finished head back for owner Rosalio Espinosa and trainer Martin Trejo. Jockey Jorge Linares rode the LQHBA Sale Futurity(G1) winner to second fastest time. Bred by Julian Stevens III, from the Royal Shake Em mare No Matches Tonight, Jrs Taylors Runnaway has banked over $252,000. Jet Black Secret, under jockey Noe Castaneda, was a nose back to finish with the third fastest time for owner Flying G Racing LLC. Roy Roberts trains the Jet Black Patriot gelding out of Devins Secret by Dashin Bye. Also lightly raced, the 3-year-old has only one win in five starts. Robicheaux Ranch Inc./MG is the breeder. Making his first start since finishing fifth in the LQHBA Louisiana Million Futurity(RG1) in December, Featuring Fast Jess was a three-quarter length winner in the opening trial to post the fourth fastest time of :19.974 seconds, a 93 speed index. Jockey Noe Castaneda had the riding call for trainer Eduardo Morales. Fernando Ramos owns the sorrel gelding bred by Jumonville Farms and Burnett Ranch from the Mr Jess Perry mare Featuringmissjess. She has compiled a (9) 3-1-0 record and earned $63,020. The only other sire with multiple qualifiers with Heza Fast Dash who sired two finalists. To see the complete list of Mardi Gras Derby qualifiers, with their times, sires, dams, owners, breeders, trainers and jockeys CLICK HERE.